Hanging a fan at the correct height is very important for optimal performance. But once you figure out where you want the fan, how do you order it? AirVolution-D, our direct-drive fans, can only be connected with a single piece of drop tube. Extensions cannot be added. Therefore it’s important to order that drop tube correctly. Let’s say you are ordering an AVD-780, and the blades need to be 7 feet from the mounting point. There is no need to calculate the drop tube length by account for the mount and motor. 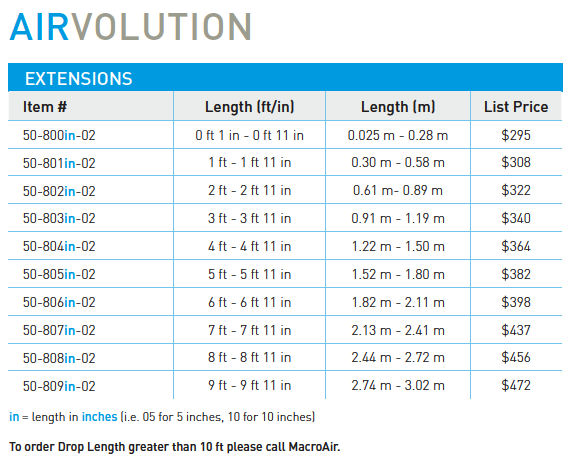 Simply note the desired drop length (7 feet) on your purchase order, and we will calculate the length of the drop tube. 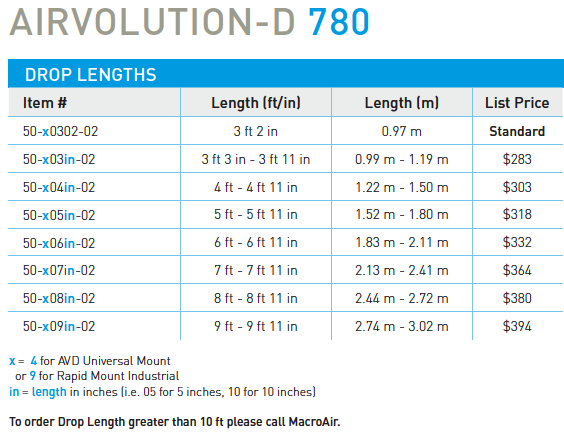 In the Product Selection Guide page 5, you will find the list of AVD-780 drop lengths. For our AVD-780 order, the drop length is 7 feet, and we are using a universal mount. Therefore our item number is: 50-40700-02. AirVolution, our legacy fan, comes standard with only the fan and mount – no drop tube. If you’d like to increase the distance between the mount and fan, you can order extensions. The AirVolution (mount, gearbox, and blades) is 3 feet tall. If you’d like your AirVolution to hang 6.5 feet from the mounting point, you would order a 3.5-foot extension. The extension item number would be: 50-80306-02.